ORCHARD PARK, N.Y. (AP) — Bills coach Sean McDermott overlooked Buffalo’s losing record in making the case the team’s trajectory is pointing up. “Nobody wants to be 6-10,” McDermott said Monday, a day after the Bills closed the season with a 42-17 win over the Miami Dolphins. “I’m more concerned about the direction of the organization,” he added, before referring to the strides Buffalo’s first-round draft picks, quarterback Josh Allen and linebacker Tremaine Edmunds, have made since Week 1. 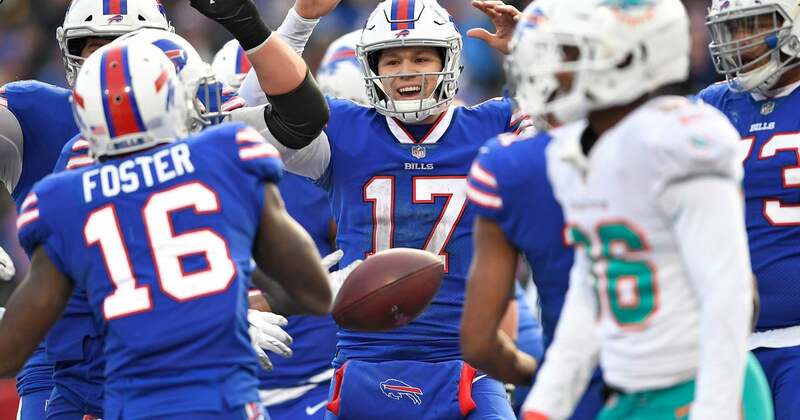 Optimism prevails in Buffalo despite the Bills taking a significant step back a year after a 9-7 finish in which they ended a 17-year playoff drought. What buoys McDermott and general manager Brandon Beane two seasons into their tenure is seeing signs of their youth movement taking root with Allen and Edmunds at key positions. And they’re further bolstered in knowing the Bills enter the offseason with a tremendous amount of resources to add talent in both free agency and the draft. After spending the past two years purging high-priced contracts and underperforming players, Buffalo can start adding veterans at positions of need. The Bills are projected to be nearly $90 million under the salary cap, according to Spotrac.com, and have stockpiled 10 draft picks, starting with the ninth overall. Just don’t expect Beane to start spending all that money once the free-agency signing period opens in March. “It’s not about having it to spend, it’s about having it to be smart,” Beane said. He remains committed to taking a “judicious” approach in free agency, while continuing to build through the draft. The Bills have numerous positions to address, starting with a patchwork offensive line; a pedestrian running attack that led to running back LeSean McCoy’s least productive season of his 10-year career; and a leadership void with defensive tackle Kyle Williams retiring after 13 seasons. Beane maintained his faith in McCoy and reiterated his intention of having him return to play the final year of his contract. McCoy is motivated to be better after finishing with 513 yards rushing while averaging 3.2 yards per carry — both career lows — and scoring three touchdowns. Youth was otherwise the prevailing theme for Buffalo, which had difficulty finding chemistry during a 2-7 start but built an identity by closing 4-3. Allen showed gradual signs of progress in finishing 5-6, including a 3-3 record after missing four games with a sprained right throwing elbow. Though accuracy was an issue, Allen accounted for 18 touchdowns (10 passing, eight rushing), the most by a rookie quarterback in team history. His 631 yards rushing were the most by a Bills quarterback. And Allen topped 200 yards passing in each of his final five games to match the team’s longest streak since Tyrod Taylor in 2015. Buffalo’s top two receivers were second-year player Zay Jones and undrafted rookie Robert Foster. As for Edmunds , the 20-year-old led the team in tackles, had two interceptions — including a one-handed pick on Sunday — and two sacks in 15 games. And he was oversaw a defense that made the jump from finishing 26th in yards allowed a year ago to second this year. The optimism has spilled over to the players. “Things are looking bright and looking up for the future,” said linebacker Lorenzo Alexander, who hopes to re-sign with Buffalo this offseason. He can envision Buffalo being in a position to challenge the New England Patriots for the AFC East title next year.